MANILA -- The “status quo” remains for the chairmanship of the House appropriations committee amid reports that Davao City Rep. Karlo Nograles would be ousted as its head, Minority Leader Danilo Suarez said on Monday. Suarez made the announcement to House reporters as the plenary session remains suspended for more than three hours as of posting time, causing a delay in the deliberations on the proposed 2019 national budget. The plenary debates on House Bill 8169 or the 2019 General Appropriations Bill (GAB) was supposed to start at 10 a.m.
Suarez earlier claimed that Nograles will "definitely" be ousted as appropriations chairman. "Definite na 'yan. Karlo will be replaced pero definitely, may acting chair mamaya sa plenary," Suarez was quoted as saying in an online news article. Nograles, meanwhile, dismissed the ouster claims, saying the minority leader cannot speak for the majority coalition. He also noted that Suarez has in fact already withdrawn his previous statement. "Be that as it may, if anybody wants to remove me as Chair of the Committee on Appropriations, then they can have the position, but they cannot be allowed to make the President break his promise to our people, and they cannot be allowed to deprive millions of Filipinos in so many provinces nationwide of the programs and projects that our kababayans and my fellow probinsyanos need, by tinkering with the budget. 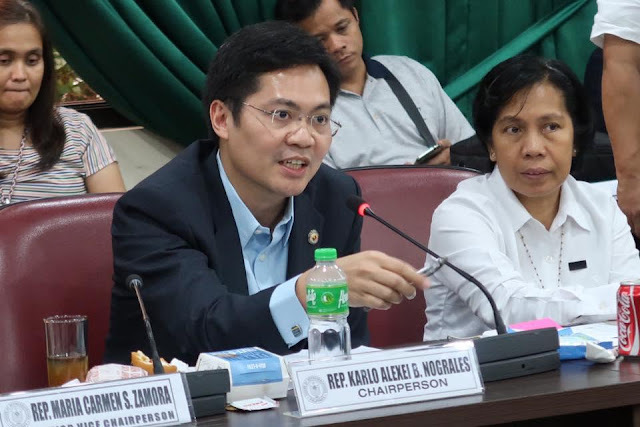 This budget is for the needs of our people," Nograles said in a statement. The House appropriations committee started its budget hearings last July 31. On Aug. 11, the panel temporarily suspended the budget briefings amid lawmakers' opposition to the Department of Budget and Management’s proposed cash-based budgeting system. However, the House resumed hearings on Aug. 28 after reaching an agreement with the executive branch on a transitory cash-based budgeting system. Budget Secretary Benjamin Diokno said this means extending the payment period for projects to six months to June 2020, instead of the initial proposal of only three months or until March 2020, since 2019 is an election year. In an annual cash-based budget, contracts intended to be implemented for the fiscal year should be fully-delivered by the end of the year. On the other hand, a multi-year obligation-based budgeting system allows the government to enter into a contract or "obligate funds" without requiring the actual delivery of goods and services within the year.